Any article whose top and bottom are circular, parallel, and of unequal overhang, such as Fig. 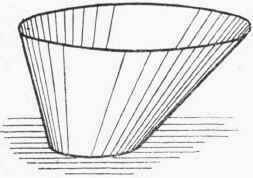 144, can have its pattern developed as a frustum of an oblique cone. The pattern for such an article is shown set out in Fig. 145. 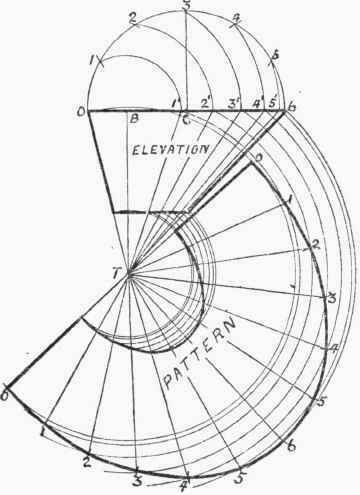 Although the shapes seem somewhat different, the same method of construction for obtaining the pattern lines can be followed as in Fig. 143; the lines being denoted in exactly the same manner. No allowances for wiring or jointing have been added to the net pattern; but these can be put on as required.